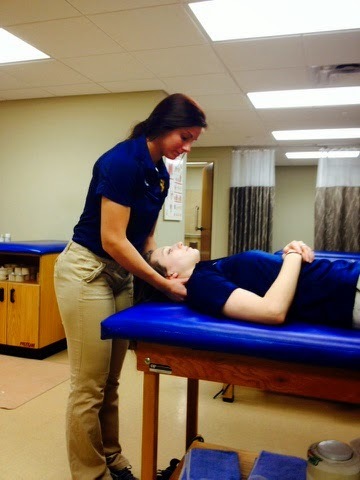 Saint Louis University Athletic Training Program: JBS – A welcoming family to SLU AT Students! This semester at John Burroughs School has been awesome! John Burroughs School is a private school located in Ladue, and it has grades 7-12. The middle schoolers have PE, and all of the high schoolers are required to play a sport, so everyone is active, and there is a lot for us to do! Dean Tiffany ATC is the athletic trainer, assistant athletic director and head wrestling coach at JBS. He wears many hats and somehow finds time to do everything! This season we became very familiar with wrestling, and put in a lot of time at wresting practice, meets and tournaments. Every year John Burroughs hosts two large wrestling tournaments. We were lucking enough to have three direct observation students at one of the tournaments. They were very excited and enjoyed asking us questions to see what they have to look forward to the next two years. Towards the end of the season one of our wrestlers sustained an elbow injury. 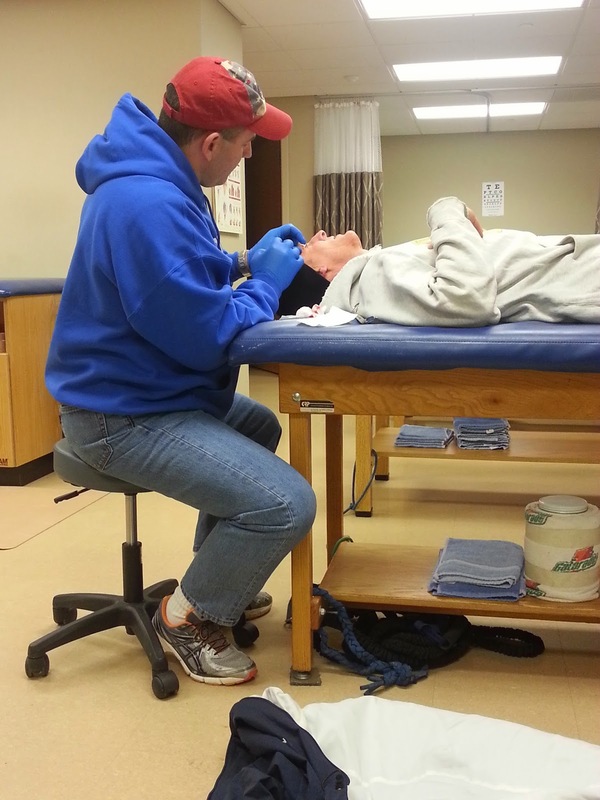 He would get it taped and we would use modalities to help alleviate his pain. He worked to overcome the injury, and ended up getting 6th place at the state meet. As he gets ready to play baseball, he is taking some time off to rehab his injury, and will be starting a throwing program with us soon. Here at JBS, everyone is family. Not only do we take care of our athletes, we have cared for fans and coaches as well. One of the assistant wrestling coaches would come to us almost every day and let us work on his shoulders. He knows that we are still learning and has had many students practice on him in the past. He has gotten good at judging how well we are doing. He gives us feedback in addition to what Dean tells us, so while we are helping him, he is helping us. During a basketball game, a spectator seemed to not be doing well, and another spectator got our attention. When we got to him, we could tell he was showing signs of a stroke, so we made sure his friends made sure he was comfortable while we activated our EAP. And one of our coaches jumped down a flight of stairs to avoid falling, but landed too hard on his calcaneus and broke it. He has been coming into the athletic training room to do some of his exercises and stretches now that he has had surgery. The community at this institution is unreal. Everyone is supportive of each other and their endeavors. If a teammate is hurt, the whole team is behind them and encourages them through their rehab. If a game is going on, there are always students there watching, cheering on their friends. We feel as if we have become a part of the family. This is truly a great place to be. Every day is a learning experience here at Burroughs. We look forward to coming in every day, and seeing the athletes. As winter sports are wrapping up, everyone is getting ready for the spring. We are ready to warm up and watch soccer, lacrosse, baseball, tennis, and track. It’s time to thaw out and enjoy the outdoors! GO BOMBERS!